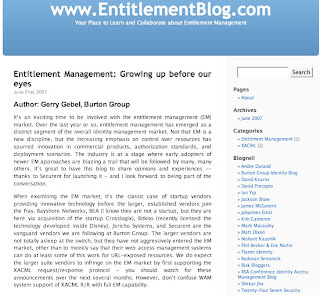 The guys over at Securent have started a blog dedicated to discussion around entitlement management (EM). It'll be interesting to see what type of content gets posted on there and exactly how much discussion it will facilitate. They're off to a decent start I suppose, getting Gerry Gebel from the Burton Group to contribute. There's no real meaty content yet however. Securent CEO Rajiv Gupta's entry is the stock standard spiel about EM. The only reason I found out about this site was through referrals to my blog. I'm starting to see traffic from www.entitlementblog.com and was wondering how in the world this was happening. So I checked it out and was surprised to see my name on the blogroll amongst some illustrious company. There have been how many data loss cases? !